Energy Savers Eco Fair a wonderful day! 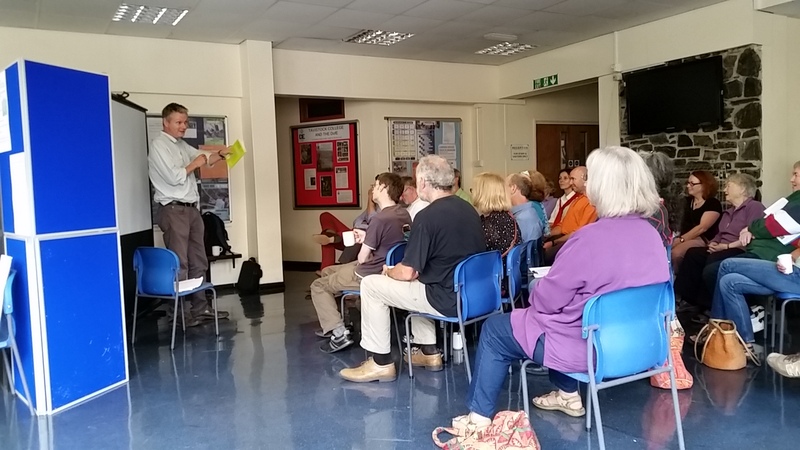 We had a wonderful day at our Energy Savers Eco Fair on Saturday (20th Sept. ’14) and Tavistock College proved, once again, to be a great venue. Our visitors and exhibitors said they enjoyed it as well! About 140 people enjoyed the exhibits and talks; and Matt Harvey had a good audience, and lots of laughs, for his performance of his new work ‘The Element in the Room’. 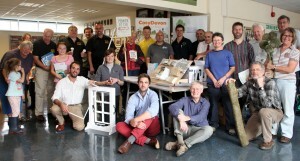 We’d like to thank our exhibitors and advisors including New Generation Energy, Worth Electrical Wholesalers, Mantle Panels, Pure Vision, CosyHome Company, South West Renewables, Sungift Solar, Plymouth Energy Community, Greenhus, RegenSW, Graham Lawrence and our own Roots to Transition and Tavistock Woodlands Group as well as all our visitors and especially our volunteers who have helped make the event a success. Thanks to Merlin from Moretonhampstead Energy Savers for the loan of the solar powered bubble machine! … and we raised £180 towards Tavistock College Solar Schools Fund. If you have any comments about the event … or any questions … please get in touch at info@transitiontavistock.org.uk (07969-569-444). This entry was posted in Uncategorized on September 25, 2014 by Transition Tavistock. Come along to the Energy Savers Eco Fair – exhibitors, talks, fun! Winter’s round the corner … time to think of energy saving! We invite you to our Energy Savers Eco Fair on Saturday (20th Sept) from 10:00 to 16:00 – Tavistock College. Come and hear Matt Harvey, a poet with a difference … with his energy inspired performance ‘The Element in the Room’ at 12:15. 11:30 Renewable energy – how can you benefit? Bring the children. Energy related activities to keep them entertained! Guess the age of the electronic device? Support Tavistock College Solar Schools campaign. Relax and enjoy delicious soup, cakes and drinks. To get in touch: Kate: 07969-569-444; or email info@transitiontavistock.org.uk. This entry was posted in Uncategorized on September 18, 2014 by Transition Tavistock. We have seventeen homes open this weekend. Householders are sharing their experiences in building, renovating or improving their properties to improve their comfort and reduce their energy costs. Tavistock town – the Pannier market and their LED lighting investment, 29 West Street – a five story victorian town house, Tiddybrook – a new build and renovaton with a water based heat pump; and New Generation Energy – one of our local renewable specialists with an Open Day today (13th). Join our walking tour from Bedford Square at 10:00. Wonnacott Farm at Lewdown – a chance to tour this listed organic farm and see their renewables in action (solar thermal and log boiler for several properties). Bus tour from Bedford Square at 10:00 (Sat 13th). Chipshop and Bere Peninsula – Woodovis Park: award winning holiday park with lots of energy saving features; Hunters Oak: bungalow with pellet boiler, adjustable PV, passive solar and beautiful productive fruit and veg; The Counthouse: Listed renovation of historic Smelting Works – spectacular buildings; Rumour – new build crammed with features and heating and hot water costs since March 2014 of 45 pence! Bus tour from Bedford Square at 13:00 (Sun 14th). Yelverton and Crapstone – Lechmere: ground mounted PV with automated tilting; Clanage: 1960’s bungalow improved to EPC rating ‘B’ (81) with cavity wall insulation, air source heat pump and more; Sunny Waters: a local example of external wall insulation fitted by local provider. Bus tour from Bedford Square at 10:00 (Sun 14th). Tamerton Foliot and Roborough – Keeper’s Cottage: stunning glass fronted extension to listed property – renewables, wood fuel and energy saving features; 12 Woolwell Drive – solar technlogies including forced air system and simple energy generating ideas e.g. black out blinds. Bus tour from Bedford Square at 10:00 (Sat 13th). 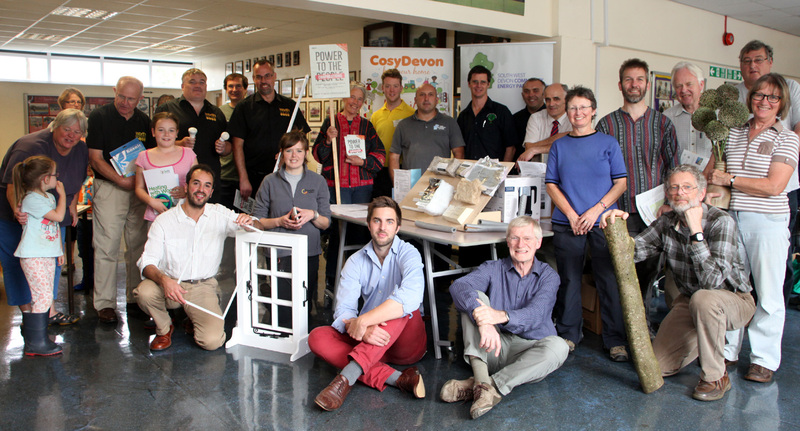 And don’t forget our Energy Saving Eco Fair next Saturday (20th September 10:00 to 16:00) at Tavistock College. This entry was posted in Uncategorized on September 13, 2014 by Transition Tavistock.